Born in Doncaster in 1921, pianist Bernie Fenton worked with a number of provincial bands before coming to London where he played at the Number One Rhythm Club in 1941 and Johnny Claes in 1942. He joinied Oscar Rabin in 1942, staying until late 1945. 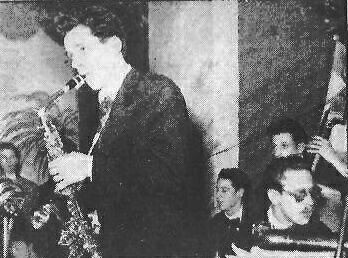 He was with the Tito Burns Sextet from 1947 to 1948 until the founding of Club Eleven in December 1948 playing in the Johnny Dankworth Quartet with Joe Muddel and Laurie Morgan. His jazz career did not last very long, and he was with Paul Adams from 1948 to 1951, then Harry Parry. He then worked for many years as an arranger for a music publisher before returning to freelance work in the 1980s and 1990s when he was featured with a Glenn Miller tribute band originally led by Herb Miller. Bernie Fenton died in 2001. Gone With The Windmill (take 1)*#/Gone With The Windmill (take 2)*/Barbados*/Elevenses*/Ool-Ya-Koo*. George Chisholm (tb), Danny Moss (ts-1), Bernie Fenton (p), Harold Smart (org), Ernie Shear, Bert Weedon (g), Major Holley (b), Micky Greeve (d). Big band directed by John Miller including Ronnie Ross(as,bs) and Bernie Fenton (p).